Janice Crawford grew up in Miami, but spent summers in New Hampshire at her grandparents’ house, which, she said, always felt like “a safe haven.” So after finishing up her master’s degree in education down south, she moved to the Granite State in 1984 and eventually took on a job at Purity Springs Resort, a four-seasons ski resort that taught her the ins-and-outs of running a tourism business. 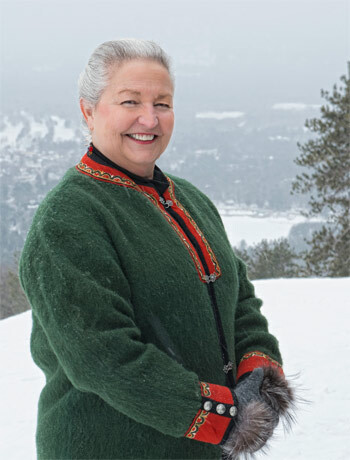 That experience has served her well in her longtime role as executive director of the Mount Washington Valley Chamber of Commerce, the leading voice promoting the Valley as a tourism destination. When Janice first became involved with the chamber, it was in financial disarray, deeply in debt and bleeding out members. As a board member and later executive director, she helped right the ship, and under her guidance it has grown to become one of the largest chambers in the state. Since she took the reins in 1997, its membership has grown from 200 member businesses to more than 800. When she was hired, Crawford went door to door to meet with all the businesses in the Valley — no mean feat in a rural region of 27 towns — taking all the businesses’ suggestions to heart to figure out how the chamber could be of help going forward. In her time there, she has created numerous programs to promote the region and help local businesspeople. These include: Leadership MWV, which has mentored 65 young professionals in the region; a breakfast program for businesswomen; and Community Celebrations, which helps towns fund things like fireworks and parades, among others. A health advocate and two-time breast cancer survivor, Janice sits on the boards of Memorial Hospital and White Mountain Community Health Center and created a foundation that provides funds to uninsured and underinsured women so they can receive free screenings. A. I was on the board of the chamber in ’93 and the chamber had a very unfortunate turn of events, where it was realized that we had a very large debt and we were losing members right and left because our services weren’t what they needed to be, which can befall any chamber. So being on the board at that time I felt a personal responsibility, and several of us stepped up to the plate to do the grunt work of really digging through everything. We worked through that process very well and I was hired for the position three years later. A. I have never learned how to be diplomatic, because I’m impatient. It’s because in my mind I can see the path, and think everyone ought to see it with me. I do not at all play politics — I don’t know how. I’m sure that those aspects of my personality — diplomacy, non-political animal, saying what I think — have kept me from achieving much, but I’ve also achieved a lot, and I don’t know whether I would have if I’d been more meek and mild and less boisterous. A. I will always be grateful to the owners of Purity Spring, the Hoyt family. They gave me an opportunity to work in a field I didn’t have degrees in, marketing, and they really sacrificed their employee to the betterment of the community, because as we were rolling through these issues at the chamber I really spent a lot of time working there when I should probably have been working at the resort. A. I don’t. I don’t do it at all. I live, eat and breathe my work, but I choose to because I enjoy it. I am constantly thinking about the members and what I can do to better the economic environment for them. I’m not advocating it. In not living a balanced life, there are sacrifices I made that I have to live with. A. Finding balance is important, but when starting out, the balance has to tip the scale on the side of your career goals. That’s why it’s very important to know yourself, so that you can make good choices when choosing your path.